Back in February SA featured a track by the Telescopes from way back in the dim and distant past, 1991to be exact. As I commented over at The Bagging Area, I think I dismissed this band as another load of Shoegaze bandwagon jumpers and MBV soundalikes at the time without even giving them the courtesy of a listen, something I'm not proud to say I did pretty frequently back then, less so now but I have still to knowingly have heard a track by Cabbage on account of them having such a pish name. I know my bad, as the LYT would never say. 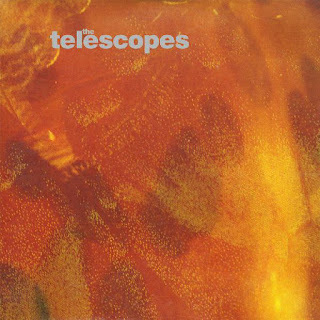 Back to the Telesccopes. After listening to Flying I decided that these bandwagon jumpers were not half bad and I had done them a huge disservice at the turn of the 90s so forked out for Splashdown: The Complete Creation Recordings to explore further and very good it is too. The outstanding track for me is Celestial, a blissed out, strung out version of the band's single Celeste, the single prior to Flying. I would have loved this tune back then and think it would have been given some serious turntable time. Ok, now it sounds quite of it's time and quite My Bloody Valentine(ish), so I was right in one respect, but that is no bad thing, there are worse periods in music or bands to be reminded of. Kicking myself a bit to be honest for not picking up on this lot at the time, in my defence there was so much good music coming out in 1991 that it was inevitable that some would slip under the radar. Good post Drew. Glad I turned you on to them but now I need to buy Splashdown. There was a lot of god music in 1991 and there was no way you could buy it all.